Months of writing, choreographing, practicing, and performing culminated in the 2017 Samsara performance this Saturday, Feb. 18. Hosted by Shakti, the University’s South Asian club, Samsara featured a wide variety of performances that ranged from Bollywood style dances, to a hilarious skit, to spoken word poetry. Having participated in the event, Neha Srinivas ’20 as a choreographer and Emmy Hughes ’20 as a dancer, we’ve chosen to relive the show’s excitement by writing about it. 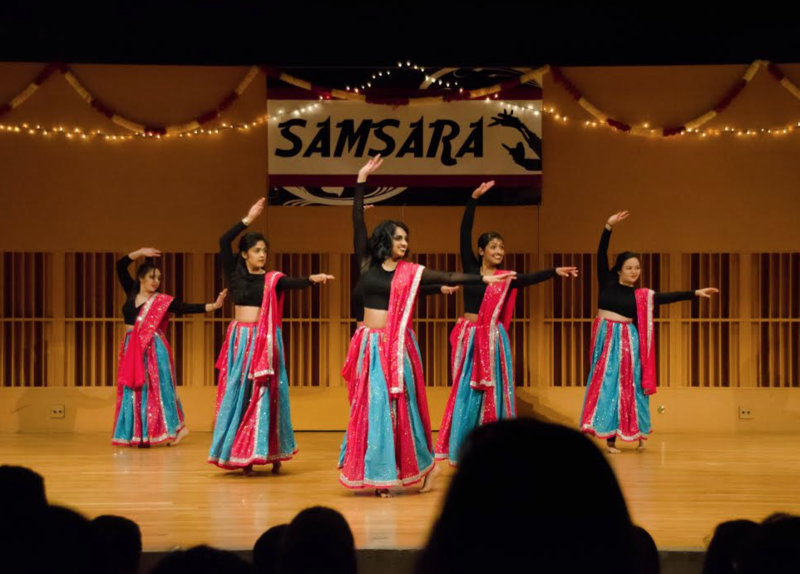 Shakti has been organizing for Samsara since the very beginning of the school year, with the script writing process beginning as early as September and rehearsals for class dances began in November. “As a freshman you’re just participating, but as you get older you’re more in charge of organizing and can have a say in how things are run,” said Sohil Khanna ’18, who participated in the senior/junior dance and in the skit. Regardless, the eager Shakti first years were invested in perfecting their dance. First years primarily practiced in the Nicolson lounge, using the window as a vague reflective surface to ensure they were keeping time. Practice was held multiple times per week, and, despite rough beginnings, the dance was perfected by the time it appeared on stage. Their last practice was four hours long, but was sweetened with a large order of Chinese food. In addition to Bhandari and eight other first years, Nikhil Ghosh ’20 participated in the first-year dance, in addition to acting in the skit and performing a classical guitar piece accompanied by Sanam Godbole ’19 and Kavya Padmanabhan ’18. On preparation, Ghosh also noted that practices were time-consuming. “It was really rigorous, and at times kind of difficult, being that it was sustained on top of schoolwork and whatnot, but it wasn’t for a super long stretch of time so it was really rewarding to put in that kind of work and then have such a fulfilling experience on stage,” Ghosh said. Practices, though often rigorous, offered a range of hilarious moments for students involved. Speaking from experience, performers in the first-year piece broke into random dance breaks that differed in style from the Bollywood-esque moves they were perfecting. (Most notable of these moments was to the dulcet notes of Shakira’s “Hips Don’t Lie.”) Many serious practices turned into gossip sessions, whether about India’s hottest location for grad trips (Goa) or that junior guy who successfully captured frosh hearts. Ghosh recalls a moment in question when he tried to balance hunger and rehearsals. Despite setbacks, event participants felt fairly prepared when Saturday rolled around. Three hours prior to the performance, Bhandari and Fakiraswamimath, who both acted in the skit and participated in the first-year dance, expressed their excitement about performing. Bhandari noted that, despite her excitement for the event, she maintained a bit of worry. “I’m actually really nervous, because I’ve never done anything on stage before. I was always in the back for performances in high school so this is my first time being on stage, as someone, who, you know, has a line! Wow! So, I’m excited but nervous,” she explained. “I think people put in a lot of work for this, and the choreographers and stuff are really serious about what they do, so I think it’ll be really good,” Bhandari added. According to audience reactions, the show went over well. The hall was almost entirely filled up, with 339 people in the audience—the largest audience Samsara has had in recent memory. By the second line of the skit, a reference to the iconic Kama Sutra positions, the audience was laughing up a storm. Likewise, each dance piece received warm applause, especially some of the more expert dances. WesMalai for example, the University’s official Bollywood dance group, put on a swirling performance that demonstrated the immense skill of the performers, enunciated by sparkling blue and pink skirts. Suhail Yusuf Khan, a graduate student at the University, played the sarangi in an electrifying performance, alongside Poorya Pakshir, also a graduate, on an Iranian drum. Tara Joy ’20, who attended the event, expressed that she had an excellent time. The show finished with a final group dance number, in which all members of the cast and dances performed and then posed for an enthusiastic audience. Seniors of Samsara, notably Grewal, who organized the entire event, received gifts from the younger performers. The cast posed for numerous group photos and selfies, changed, spent some time cleaning up Crowell Hall, and then headed to the afterparty. The performers themselves overall expressed that they felt the evening was a success. Likewise, Faizan Razak ’20, who played the romantic lead in the skit alongside Bhandari, expressed excitement over the way the show went. After the performance was the afterparty, where participants and friends alike celebrated a successful night. “The afterparty was also pretty awesome and was a really great bonding moment for Shakti,” Razak said. For many, the entire experience served as an opportunity to strengthen friendships. Shakti is not limited to the South Asian community, with its several participants of non-South Asian heritage testifying to this openness. Shakti meetings are open to anyone who is interested. We just want to spread the love.